From October 2015 to May 2017 Maria Rios-Mathioudakis worked for The AjA Project (non-profit) as the Program and Artistic Coordinator of their Creative Team. During her time as a part of AjA's Creative Team she poured her creativity into its Public Art projects. The entire Creative Team at AjA is credited with these projects as they were collaboratively produced. Unshelteredconversations.org Mural located on 6th Avenue in Hillcrest between Pennsylvania Avenue and Robinson Avenue. The AjA Project’s (Un)Sheltered + Conversations Photo Mural (6th Avenue / Pennsylvania) and Interactive Media Gallery highlights the lived experiences of nine people with various connections to, and experiences with, homelessness in San Diego. Flight+PATHS was developed through a series of community-based workshops. The AjA team compiled content for the piece in the forms of portraits and participant stories. 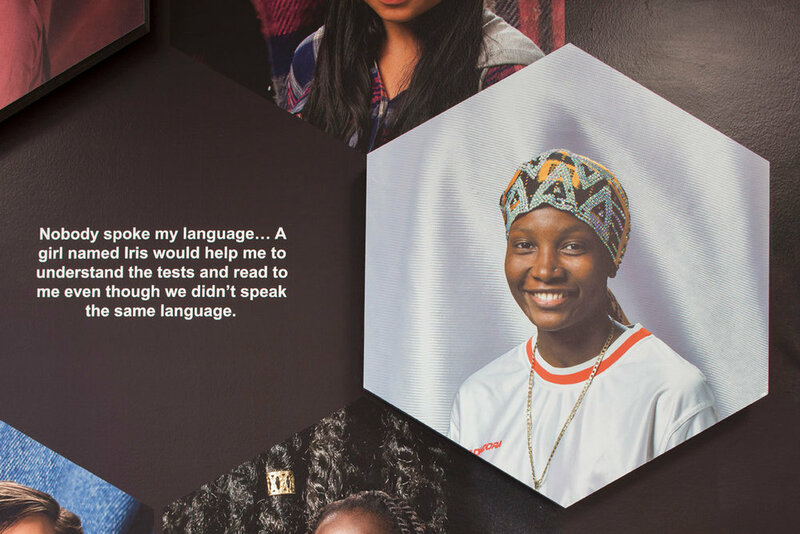 All of these components were designed into mural displayed alongside showcases full of personal objects hghlighting the hope, strength, and resiliency of San Diego’s immigrant and refugee communities. Working in partnership with the Japanese Friendship Garden, Momentum Learning and The AjA Project implemented a series of workshops that introduced students to the art of origami and photography with an emphasis on the use of abstraction and symbolism. On December 16, 2016, participants visited the Japanese Friendship Garden for a photographic field trip where they captured the colors, patterns and textures of the garden to symbolically represent aspects of their identity. During this exhibit, the finalized work of the students will be in full display.